Product Review: KittiKrack By TwinCritters: A Six Cat Review! I confess! My cats were offered KittiKrack, and I gave it to them! Don’t judge until you try it! I have six cats in my apartment. (Don’t ask about all the cats I have hidden in the basement!) My cats need to play every day. It helps them get along better as a pack. Having a little fun time as a group redirects all their energy. So I’m always interested in finding new things for them to do instead of hissing at each other. 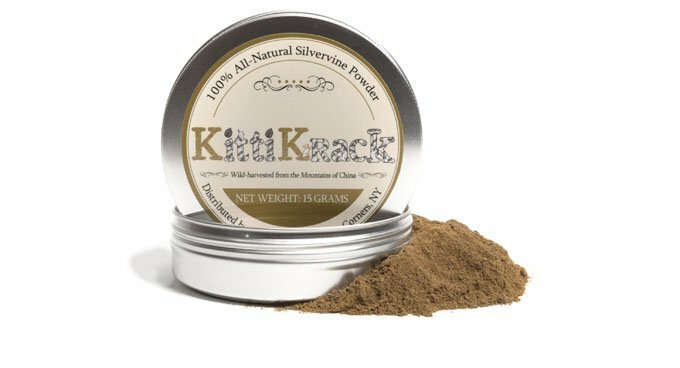 KittiKrack, by TwinCritters, is made from all-natural, 100% silvervine, which is a climbing vine native to the mountainous regions of China and Japan. It is similar in effect to catnip, but considered more potent because it triggers two olfactory regions of the cat’s nose. Plus, it works on a higher percentage of cats. I ordered KittiKrack from Amazon. Before its arrival, TwinCritters sent me a page of information about their product and how to use it. They recommend supervising your cats, always a good idea. Plus you wouldn’t want to miss how crazy your cats get on this stuff! KittiKrack comes in a little baggie, inside a metal canister, which I thought was great. I’m sick of leaky plastic bags of catnip spilling all over my drawers. Plus, the metal canister keeps the KittiKrack safe from aggressive cats trying to score another hit of their new addiction! Okay, it doesn’t cause addiction. But they REALLY LIKE it and WANT it. KittiKrack came as a brownish powder. I was told the “recipe” was recently revamped. The earlier incarnation of KittiKrack was not as potent in its leaves and stem form. The makers discovered that the silvervine fruit ground up to a powder form elicited a way stronger response. I pinched a little, and put it on the floor. The rolling and purring started right away. What I found interesting was that my cats weren’t just more playful, oh, yes, they chased toys, rolled over on them, then forgot what they were doing. It was that they completely chilled out. It had a dual effect. It was nice to see them mellow out. Being a member of a large cat gang can get stressful. It was especially hilarious to see my old, shy orange cat knock the young guys out of the way for more. It is powerful stuff. You don’t need to use a lot. They recommend a quarter teaspoon per playtime. My one cat licked and licked and licked the spot where I put it. You might want to put a plate down. Or you know, not put it on your pants by accident, and then your cats won’t tackle you, and lick your pants incessantly. While KittiKrack may be a little pricier than other brands, you get a high quality, fun experience for your cats, and you’re supporting small business. All my cats had a fun time with KittiKrack. Six tails up!